Full Conference registration fees include all meeting materials; admission to general sessions and the exhibit hall; Monday Sponsored opening reception, Monday, Tuesday, Wednesday lunch, and refreshment breaks. One day registration fees include access to the general session and exhibit hall for a single day. Organizations that register three attendees at the full-conference rate will receive one complimentary registration for the full-conference. Complete the online form for the first registrant. When you arrive at the Registration Summary page, click Add Persn (not the Add Guest button on a previous page) and enter your second registrant. Repeat this step for the third registrant. When done, click Finished Adding People. You will then receive a code to use when registering for your fourth, complimentary, registrant. All registrants must be from the same company. In order to qualify for this promotion, all registrants must be from the same company. Please contact us if you have any questions. Full conference registrants can pay a nominal fee of US $125 to bring a guest to the opening reception on Monday, November 12. A guest cannot register on their own and must not work in an industry related position. Co-workers or associates in the industry do not qualify. Guests must be at least 21 years of age. Guest registration includes admission to the opening reception only and does not include education sessions, invitation-only events, and continental breakfast or lunch meal functions. If you have already registered as a delegate to attend IASS and want to add a guest to your registration, contact Namratha Apparao. Full Conference and One Day Registrants: Refund or credit, less a US $125 administrative fee, will be given for cancellations received by Thursday, October 4, 2018. 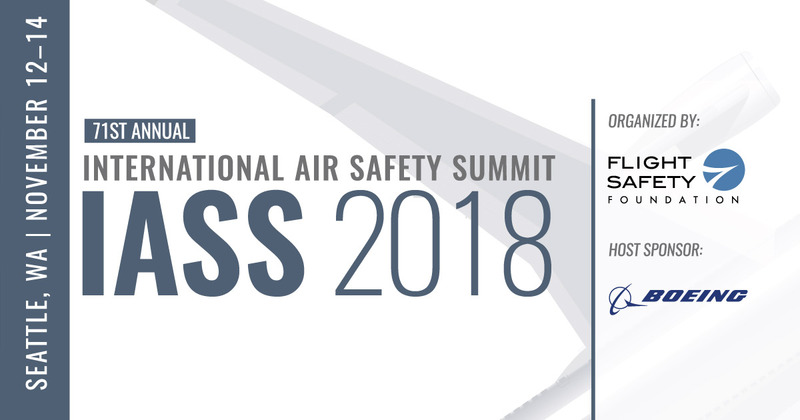 Between October 5 and October 12 you can cancel and receive a credit only, less $125 administrative fee, for a future Flight Safety Foundation meeting, summit or workshop to be used within one year. Credit cannot be applied towards membership dues or the annual networking dinner. No refund or credit will be given for cancellations received after October 12. Substitutions are welcomed at any time. Guests: A full refund will be given for guest registration cancellations received by Friday, October 6, 2017. No refund or credit will be given for cancellations received after October 6. Substitutions are welcomed at any time. All cancellation, refund, and substitution requests should be sent via email to Namratha Apparao.